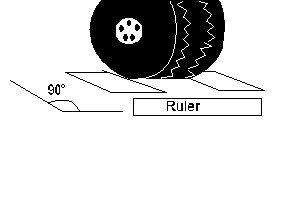 1 x square, carpenter's square, or something to help you square the paper to the tire. First, make sure all 4 tires have the same pressure (i.e. 40psi). You dont have to, but it makes things easier when you make your calculations. Next, you will be measuring the length of your tire contact patch in inches. So, take your two pieces of paper, and your ruler, and place them on the ground. One piece in the front of the tire and one piece in the rear of the tire (see fig. 1). You want the pieces of paper to be perpendicular to the tire. Make sure the pieces of paper are tucked as far under the front/rear of the tire as possible, then measure the distance between them. Write down the distance on your work sheet. (Optional) Repeat a few times to ensure accuracy. Now, you will measure the width of your tire contact patch in inches. 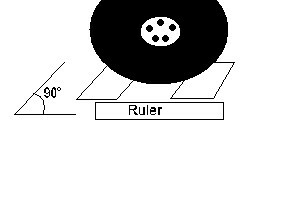 Take your pieces of paper, and place one on the outside of the tire, and one on the inside of the tire (see fig. 2). Make sure the pieces are perpendicular to the tire. Tuck as far under the tire as allowable, then measure the distance between the pieces of paper. Write down the distance on your worksheet. (Optional) Repeat a few times to ensure accuracy. Repeat steps 1 & 2 for all 3 remaining tires. Write down the length and width for each tire on your worksheet. Length x Width = Area in sq. in. Repeat for 3 remaining tires, and youll have the weight at each corner of your vehicle. If each tire has a different pressure, then use that pressure in the calculation for weight. Then you will have a more accurate idea of the weight of your car. ill try and post the actual results from her test later tonight. ^lol... its not too hard, just follow the instructions, and youll do fine. dont think about it, just follow...lol.